Courtney Roggmann has owned and operated Solutions Travel from her home since January 2005. She began her career in the travel industry in 1998 and worked in several storefront agencies until deciding to open her own business. Over the years, she has journeyed to Great Britain, France, Italy, Mexico, Ireland, many islands in the Caribbean, and some amazing states in the U.S. Courtney especially loves to travel by cruise ship! Courtney enjoys planning all sorts of travel experiences, but she has a deep love for group travel. 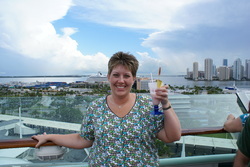 She offers one group cruise or tour a year that she escorts, and several local group trips as well. If group travel is not what you are looking for, she can customize any type of package to suit your needs. In addition to her work experience, Courtney has also earned her Certified Travel Associate (CTA) and Certified Travel Counselor (CTC) certifications from the Institute of Certified Travel Agents. She has also earned her "ears" from the Disney College of Knowledge and taken specialist courses highlighting the Caribbean and Europe. She is also proudly affiliated with Travel Leaders - Outside Agent Link.com.